How much does it cost to travel to Yogyakarta? How much money will you need in Yogyakarta? Rp714,440 ($51) is the average daily price for traveling in Yogyakarta. The average price of food for one day is Rp155,124 ($11). The average price of a hotel for a couple is Rp875,082 ($62). Additional pricing is in the table below. These average travel prices have been collected from other travelers to help you plan your own travel budget. Yogyakarta, also called Yogya, Jogja, and Jogjakarta, is Java's hub of culture and art, and is the top-visited destination on the island. While Jakarta is the most populated and industrially-developed city in Indonesia, Yogya has managed to progress without losing its cultural charm, as illustrated in its well-kept traditional Indonesian architecture. Locals are known to be some of the friendliest around and speak Javanese, Bhasa Indonesian, and local dialects. Though Yogya was previously named the city of tolerance, it is always wiser to dress modestly to show respect and courtesy to the local Muslims. The tropical climate of Yogya gets plenty of rain, with the heaviest torrential downpours from December to March when flooding is common. The short dry season runs from July through September, making for the hottest and most popular time of year to travel. Yogya's weather is consistent throughout the year, with average temperature highs in the 80s and lows in the 70s with little variation. Pack light layers to maximize versatility and for quicker-drying, as waterproof clothing will be far too hot to wear even during rainy season. Many visit Yogyakarta because it's so close to two of Indonesia's most important religious and archaeological sites, Prambanan and Borobudur. Borobudur, a Buddhist temple about 42 km northwest from the city, was constructed in the 8th and 9th centuries during the Sailendra dynasty and is believed to have taken 70 years to complete. It's a must-see attraction, considering that it is the largest Buddhist temple in the world, with 504 Buddha statues on nine platforms. The Prambanan Temple Complex, about 16 km northeast from Yogya, is the largest temple complex in Java, built in the 8th and 10th centuries. Consisting of 224 individual Hindu temples, the three main and tallest temples are dedicated to Hindu gods, Brahma, Vishnu, and Ciwa. An earthquake in 2006 caused damage to a number of the temples in the complex, so don't be surprised if you see heaps of blocks behind fenced off areas, as parts of the complex are under re-construction. Within the city, you can also check out Ullen Sentalu, a private museum containing artifacts and history about Yogya's royal family. Kraton Yogyakarta is the sultan palace, home of the Sultan and his family and includes a museum which contains the sultanate's artifacts. Kraton holds live performances of arts and culture nightly; check the Yogyakarta's official government website for listings and times. 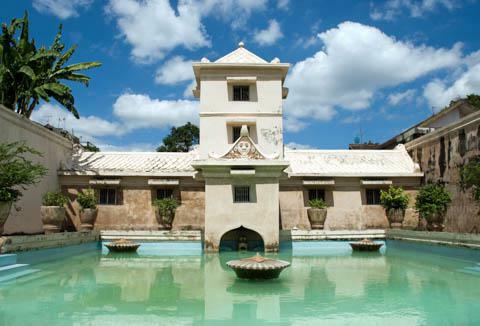 The Taman Sari Water Castle features pools and an underground mosque for the royal family. Though it's known for its numerous pools, bathing is strictly prohibited. Yogyakarta is the perfect place to soak up culture, whether you're going to an art gallery, theater, dance performance, gamelan recital, or modern rock concert, there's sure to be something to pique your creative interest while you're in town. Watch the Wayung kulit shadow-puppet play at night in the Sonobudoyo Museum, near Kraton. Kraton also holds gamelan orchestra recitals, macapat (poetry readings), and dance performances throughout the week. If you're up for an adventure, take a Jeep off-road and head over to the Merapi Volcano, where you can learn about the history of Merapi and take a four-hour hike up to the summit. Be sure to wear sturdy boots and long pants. Jomblang Cave is another place to explore if you can handle bumpy roads, an underground river, and dark tunnels. For a cultural experience in retail therapy, shop at Pasar Malioboro, Yogya's famous shopping street where you can find anything from batik clothing to souvenirs, cheap food handmade crafts, jewelry, and much more. Get comfortable with crowds and haggling, as both are expected on the 24-hour shopping street. For a calmer environment, spend a quiet afternoon strolling, horse riding, or flying a kite on Parangtritis Beach, Yogya's most popular beach with black volcanic sand, which is a popular venue to linger for sunset. If you're feeling adventurous, head up to the Parangtritis Hills to para-glide or hang glide. Don't forget to check the wind conditions before you go! Culture buffs can indulge their tastebuds in Yogya's regional specialties; after all, some of the best traditions are passed down through cuisine. One of Yogya's most famous local dishes is Nasi Gudeg, unripe jackfruit stewed in coconut milk, palm sugar, spices, and chili, sometimes served with chicken or eggs over rice. Gudeg Yu Djum serves up a mean Nasi Gudeg as well as krupuk, or deep fried-crackers. Yogya also has a plethora of international restaurants, if you want to take a break from local food. Meditteranea Restaurant is popular for its western fare, with offerings of pizza, kebabs, steak, and fresh fruit juices served in hefty portions in a cozy and modernly decorated dining room. Be sure to make a reservation if you don't arrive early, as the restaurant is often crowded. Run by a non-profit dedicated to the prevention of AIDs and HIV, Mila features vegan and vegetarian dishes of both western and Indonesian cuisine, including pumpkin soup, biryani, and tempeh. Don't be surprised when you're seated on a cushion on the floor; diners love the rustic and romantic ambiance in the gazebos among a lush garden. Yogyakarta's international airport, Adisucipto International Airport, is just eight kilometers east and has several flights daily to and from Jakarta and Denpasar. From the airport, you can take a taxi, train, bus, or rent a car to get into the city. There is a bus inside the airport and the main bus station in Yogya is Giwangan Station. If you choose to take a taxi, make sure it is metered. To be safe, you can also pay for your cabride into the city at the information counter in the arrivals hall. Take your receipt and get into the taxi stand line. Tipping is not customary in Indonesia, so no additional payments should be made after taking your receipt. If you are coming from or going to nearby cities Semarang or Solo, you can take a joglosemar, which is an inexpensive option for a shuttlebus that operates between the cities. Within the city, if your destination is not a walkable distance, take a becak or cycle rickshaw, which is a common local mode of transport to get from one area to another. Becak drivers are known to be pushy, but stand your ground and don't be shy to haggle until you come to an agreement on price or find a driver who will and you'll have no problems getting around this small city. For sites outside the city, take a tour, public bus, or taxi. Tours can be arranged by Indoparadiso or Seven Trans Jogja, both reputable tour companies which can take you to Prambanan, Borobudur, or Dieng Plateau among many other historical sites.